Star Wars: The Force Awakens is steadily making its way to becoming the highest grossing film of all time, and I did my part by attending an opening night screening. I had a blast, it was great seeing the familiar faces from 1977 back in action once more. I wasn't expecting that I would enjoy the new characters so much though, I thought they were all compelling and will look forward to seeing more of them in the future. Some have said that JJ Abrams repeated too many plot points from A New Hope, but that was not as big of an issue for me. The cantina scene was fine, I am sure that Han and Chewie visited more than one bar in their escapades. I thought having a Stormtrooper disguised as a Rebel was a pretty clever spin on the Rebels disguised as Stormtroopers from the first film. Yes, BB-8 was another cute droid hiding secret information, but he was so cool to watch, I didn't mind at all. I will say that a third Death Star type weapon was pushing it a bit though. My only real issue was that I wanted more Luke Skywalker (which I discussed in an earlier post), but I have confidence that he will have a lot more to do the next time around - at least I really hope so! Abrams actually did with this what he tried with Star Trek: Into Darkness. He took a familiar story and subverted it in interesting and fun ways. It didn't feel like a copy to me, more an homage that had a ton of originality built in. 1) ST:ID would/should have been re-titled THE WRATH OF RET-CON. Because, Abrams went a little _too_ far turning the Klingons into lobster-red rip-offs of the space lizards from V:TOS! 2) But, I'm willing to concede that he learned from that mistake by the time he started working on SW:TFA. Because, it makes a fiendish kind of militaristic sense that someone who feels he's more threatening than Palpatine, simply from having a bigger hologram, would also strive to create a bigger Death Star using a whole planet! 3) As for this cover? Brilliant-as-usual-job, Ross! :-) Which is why I'm constantly baffled as to why Dark Horse never did a crossover like this when all three properties were still licensed to them. 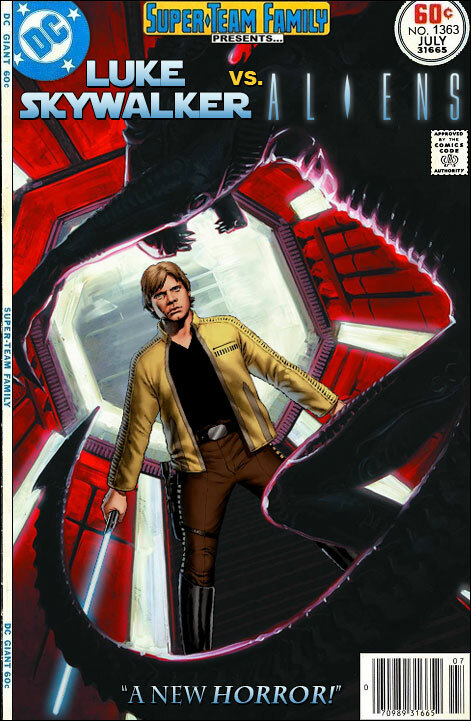 I find it amazing that Dark Horse comics had the Star Wars license for 20+ years and never did a Star Wars/Aliens (or Star Wars/Predator) comic. Couldn't have said it better myself, Mike. My guess is that part of the licensing deal was no crossovers. With corporate logic like that, it's no wonder it took 20th Century Fox so long to produce the feature film version of AvP (circa 15 years after Dark Horse had done the first successful comic book mini-series with that theme)! Huh. I wonder if a lightsaber wouldn't be a really good weapon to use on xenomorphs. Since it cauterizes as it cuts, would it prevent being splattered with acid blood?